Do you need a Fermilab Badge? If you are just coming for an event at the LPC and not staying in onsite housing, you do not need a badge. However, you must register in advance for events you plan to attend via the corresponding Indico page. Events include CMSDAS, HATS and any other workshop hosted by the LPC. selecting E-892/919 (CMS) as the Fermilab Experiment in the form and using as Fermilab contact a senior member at your home institution who has an active Fermilab badge. This person can be the same as your Institution contact and does not need to be a Fermilab employee. 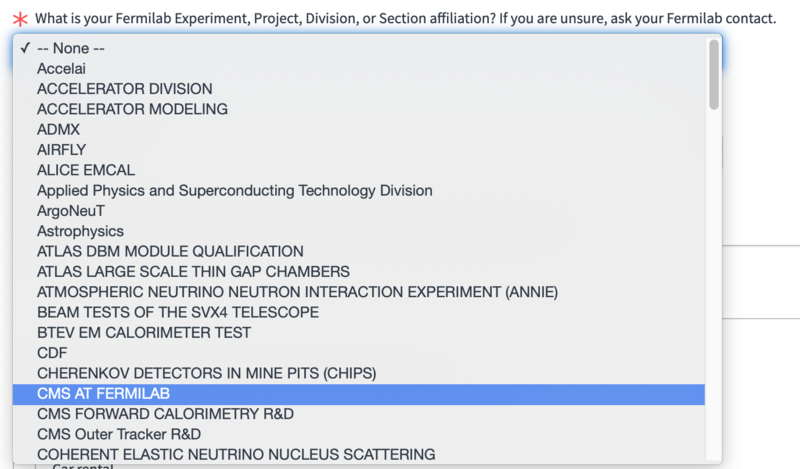 You also need to enter start and end dates that correspond to your planned activities (more than 2 weeks or periodic year-long work at Fermilab). If you get denied, please contact the LPC coordinators before resubmitting. We encourage doing this training online in advance before arrive onsite. Please note that staying on-site (village) requires a Fermilab badge (issued to users planning to work at the laboratory and not to visitors attending events). If you are only coming to attend an event and do not plan to come back to work, you are encouraged to use one of the offsite accommodations, some of which provide free shuttle service to Fermilab. Even if you already have a Fermilab ID number and computing access, the approval process for on-site access might take up to a couple of weeks. Please plan in advance if you require a Fermilab badge. The above forms should grant you computing access to the CMS LPC analysis cluster, so you do not need to follow further instructions on this page unless you would like to understand some form details better. If you are a new user you need to obtain Fermilab and CMS LPC analysis cluster accounts following the directions on this page for new visitors or employees. Be sure to choose E-892/919(CMS) as your experiment. To understand each of the form options, they are described below. If you have already filled out the new account/badge request in the forms linked above and received an email with the subject: "Welcome to the USCMS UAF (Central Analysis Facility)", then you have Fermilab accounts, and should not need the information below. On the application form, select "E-892/919 (CMS)" as your experiment - NOT any others! If you have a CMS grid certificate, you will want to put the line following "identity" as the result of voms-proxy-info after authenticating your grid certificate on a linux system. Be sure to put your CERN username in the comments. Complete and submit your request. You will receive e-mail notifications about the status of your request. Certain stages of the process may take up to two weeks. Take note that you will obtain Fermilab Services, Windows, and Kerberos credentials with instructions by email how to obtain the password from the Service Desk. The cmslpc (CMS LPC CAF) account will work anywhere from 1 hour to 1 full business day after the ticket is closed and you get the email with the subject line "Welcome to the CMS LPC CAF (Central Analysis Facility)".